Celebrate Celiac Awareness Month this may by learning more about this troubling disorder. According to the Celiac Disease Foundation, approximately 1 of every 100 people in the U.S. have celiac disease. If you have a family member with the disease, you have an increased risk of developing it yourself. 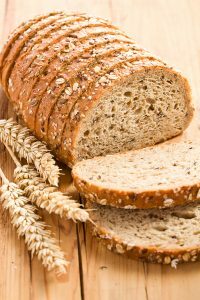 People with celiac disease cannot handle the gluten found in barley, rye, or wheat. When they eat it, their body reacts by fighting the gluten, which damages the lining of the small intestine. Nutrients are not properly digested, which can lead to malnutrition. The only way to avoid the complications is by making sure the diet is completely void of any gluten. One of the struggles people with celiac disease have is that gluten can be found in some very surprising foods. You’d expect to find wheat gluten in pasta, bread, and flour tortillas. Gluten can also be found in many seasonings used on french fries, potato chips, and even deli meats. Salad dressing, soy sauce, and candies also can have hidden gluten. It’s very hard for people with celiac disease to eat out at restaurants. They have to be very careful as some restaurants add pancake batter to their eggs used in omelets. If your mom or dad has celiac disease and you want to take them out, look for restaurants that offer gluten-free food options. Foods are not the only thing people with celiac disease must be careful using. Gluten can also be found in things like lipstick, nutritional supplements, and medications. If your mom or dad has celiac disease, awareness is key. You need to start reading labels carefully and looking for things like “starch.” Unless it specifies cornstarch, it could be a starch made from wheat and must be avoided. Talk to your parent’s doctor to get help determining what’s safe and what isn’t. Many stores have gluten-free areas for some food items, but that will only cover a small portion of the groceries your parent needs. Your mom or dad’s doctor may have you talk to a nutritionist to learn more about how to shop safely. Enlist the help of caregivers to help you with shopping and meal preparation. Your aging parent may struggle with preparing a gluten-free menu, but caregivers can help you. You’ll have peace of mind knowing your parent is eating healthy meals, and your parent gains companionship as well.